Not quite sure how, but sometime between the time I got to work this morning and the time I left in the afternoon, I lost my scarf. It was a very warm, deliciously soft cashmere scarf that I really enjoyed. For those of you not in New York, let me tell you, today was the wrong day to lose a scarf. There’s really no good time to lose a loved accessory, but today was a particularly crappy day to have done it, since it was (and will continue to be for the next few days) absolutely freakin’ FRIGID outside. Throughout my shift, before I realized I’d seen the last of my scarf, I had debated getting hot chocolate when I got out. I went back and forth in my head asking myself whether I should spend more money, whether I needed the extra calories before going to the gym, whether I really wanted to sit somewhere and drink hot chocolate alone. The second I realized my darling scarf was gone and I had a cold walk with an exposed neck before me, the decision was made: screw this, I’m getting hot chocolate. I usually go with JT’s wicked hot chocolate, a spicy, dark chocolate affair, but this time I went with the caramel hot chocolate instead, which was buttery and velvety smooth, comfort in sweet liquid form. The cookie, a good four inches in diameter, oozed with large melted chunks of chocolate, and added all the more chocolatey goodness to my afternoon sugar binge. Even though the day only got colder and greyer, I was warm and tingly inside, so chock full of chocolate I didn’t even miss that ol’ scarf anyway. 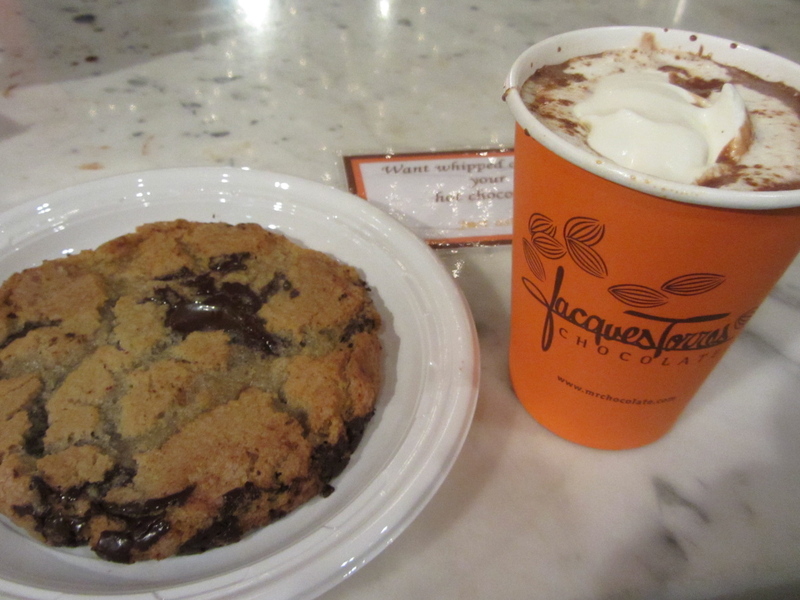 This entry was posted in Sweet stuff and tagged caramel, chocolate, chocolate chip cookies, hot chocolate, Jacques Torres. Bookmark the permalink. I love their cookies but you’ve inspired me to try their hot cocoa. Do it. Hot chocolate’s where it’s at.